360 Skin Care’s Creamy Avocado Cleanser was created as a natural alternative to chemical and detergent based products. Our creamy body wash cleanses using a blend of Coconut and Palm Oil derivatives and is fortified with the antioxidant power found in Green Tea extract and Vitamin B. Formulated to be mild but effective, our body wash will leave your body feeling cleansed without stripping your skin of vital nutrients. 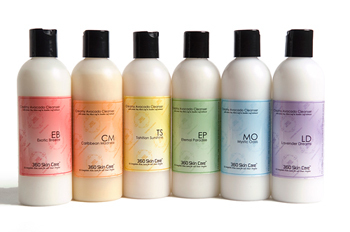 Sign up for our newsletter to save 15% and be entered to win 360 Skin Care products. ©2004-2019. 360 Skin Care. All Rights Reserved.